was corrected in Boy Scout Requirements 2006. The corrected text is shown below. Describe the biological effects and hazards of radiation to humankind, the environment, and wildlife. Explain the difference between deterministic and stochastic effects. In your explanation, discuss the nature and magnitude of radiation risks to humans from nuclear power, medical radiation, and background radiation. Explain the measures required by law to minimize these risks. Describe the radiation hazard symbol and explain where it should be used. Tell why and how people must use radiation or radioactive materials carefully. Tell the meaning of the following: ALARA, alpha particle, atom, background radiation, beta particle, contamination, curie and becquerel, gamma ray, half-life, ionization, quark, isotope, neutron, nuclear energy, nuclear reactor, particle accelerator, rad and gray, radiation, radioactivity, radon, rem and sievert, and X-ray. 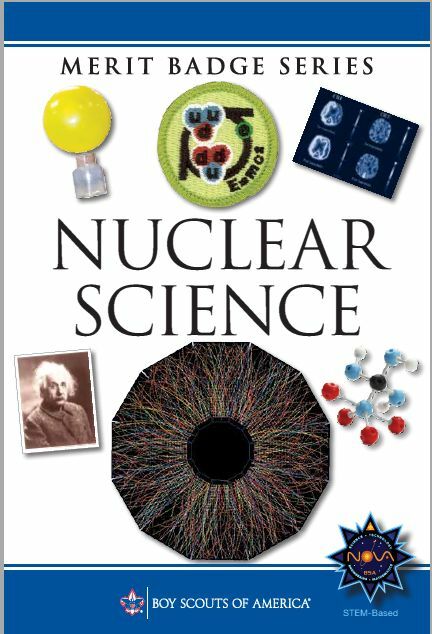 Choose five individuals important to the field of atomic energy and nuclear science and explain each person's contribution. Make a drawing showing how nuclear fission happens, labeling all details. Draw another picture showing how a chain reaction could be started and how it could be stopped. Explain what is meant by a "critical mass." Build an electroscope. Show how it works. Place a radiation source inside and explain any difference seen. Build a model of a reactor. Show the fuel, control rods, shielding, moderator, and any cooling material. Explain how a reactor could be used to change nuclear energy into electrical energy or make things radioactive. Using a radiation survey meter and a radioactive source, show how the measurements per minute change as the source gets closer to or farther from the radiation detector. Place three different kinds of materials between the source and the detector, then explain any differences in the measurements per minute. Explain how time, distance, and shielding can reduce the radiation dose. Obtain a sample of irradiated and non-irradiated foods. Prepare the two foods and compare their taste and texture. Store the leftovers in separate containers and under the same conditions. For a period of 14 days, observe their rate of decomposition or spoilage, and describe the differences you see on days 5, 10, and 14. Describe how radon is detected in homes. Discuss the steps taken for the long-term and short-term test methods, how to interpret the results, and explain when each type of test should be used. Explain the health concern related to radon gas and tell what steps can be taken to reduce radon in buildings. Visit a place where X-ray is used. Draw a floor plan of the room in which it is used. Show where the unit, the unit operator, and the patient would be when X-ray is used. Explain the precautions taken when X-ray is used and the importance of those precautions. Make a cloud chamber. Show how it can be used to see the tracks caused by radiation. Explain what is happening. Visit a place where radioisotopes are being used. Using a drawing, explain how and why they are used. Obtain samples of irradiated seeds. Plant them. Plant a group of non-irradiated seeds of the same kind. Grow both groups. List any differences you observe during a 30-day period. Discuss with your counselor what irradiation does to seeds. Visit an accelerator (research lab) or university where people study the properties of the nucleus. After your visit, discuss what you have learned with your counselor. Find out how many nuclear power plants exist in the United States. Locate the one nearest your home. Find out what percentage of electricity in the United States is generated by nuclear power plants, by coal, and by gas. Name three particle accelerators in the United States and describe the type of experiments each accelerator is designed to perform.